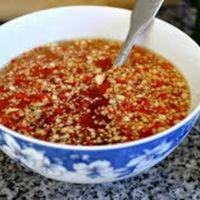 Mix together the garlic, vinegar, lime juice, sugar, fish sauce, water and chilies in a serving bowl, then cover and set aside. This looks like a nice vietnamese sauce. I like some white wine in sauces too.